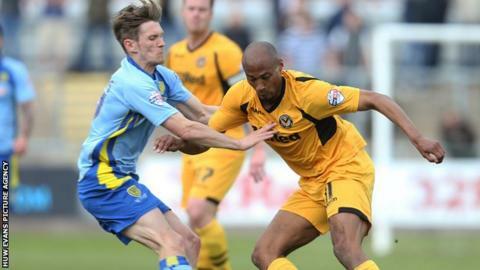 Newport County manager Justin Edinburgh has said top-scorer Chris Zebroski is close to agreeing a new contract. The 27-year-old striker scored 13 goals for Newport despite the fact he did not play for three months because of a knee injury. Edinburgh said talks regarding Zebroski's future have been progressing well. "We're advanced. I'm still in dialogue with Chris's representatives probably for the last week, 10 days," he said. "I'm pretty confident we can probably get something concluded and sealed within the next two or three days. "We're not a million miles away so I don't foresee that being a problem." The former Millwall, Wycombe Wanderers and Bristol Rovers player joined Newport on a free transfer from Cheltenham Town in June 2013. Edinburgh is also hopeful Wales international defender Darcy Blake will accept a new deal to stay at Newport County. Blake, 25, was released by Premier League Crystal Palace in January and signed for the Rodney Parade club. The club have confirmed they are in talks with the former Cardiff City player, who has been on a short-term contract with the Exiles. "He's made all the signals clear that he would like to stay," Edinburgh said. Offers and negotiations have been made or are underway with either the player themselves or their representatives. Blake, who has won 14 caps for Wales, says he will consider his County future over the coming few weeks. Edinburgh has already held talks with Blake and will meet his representative later this week for further discussions. Edinburgh told BBC Radio Wales Sport: "Darcy knows what we're trying to achieve and the good thing is he really enjoyed his time and settled in. "He's been fantastic for us and we gave him that opportunity to get back playing." Edinburgh has released David Pipe, Ryan Burge, Harry Worley but looks set to retain midfielder Mike Flynn despite previously saying he would be released. County have offered new deals to Lenny Pidgeley, Max Porter, Ismail Yakubu, Lee Minshull, Chris Zebroski, Andy Sandell and Danny Crow while the manager is still in talks with Byron Anthony. "As a manager it's never easy to tell people that their services are no longer required at the club," Edinburgh said. "There's never a good side to that, but obviously this is where the difficult part starts. "There's a few players that are out of contract at the football club that I'd like to stay. "Offers and negotiations have been made or are underway with either the player themselves or their representatives. "Hopefully we can get these concluded in the not too distant future."